"That which does not become part of the one, shall become one with the void." 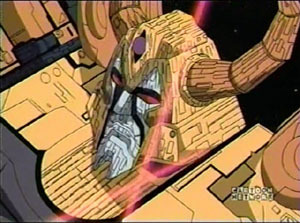 Bio: Consumption is the core of Unicron's being, providing the dominant characteristic of this dark, god-like entity. 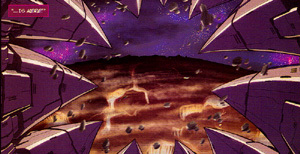 It devours everything in its path, from space trash to whole worlds, fully aware yet completely unrepentant about the dire consequences these actions have on living beings. 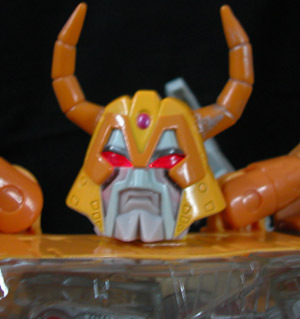 Unicron exists above and beyond such petty moral concerns, seeking only to absorb all things in order to satiate its unquenchable and inexplicable desire for more power. 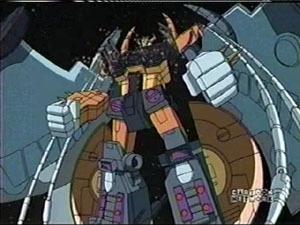 This insatiable hunger has led the creature known as Unicron across not only whole galaxies, but also entire universes and dimensions as well. 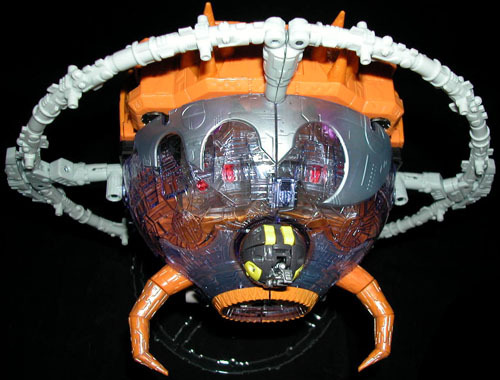 Since Unicron's thought processes, not to mention its immense size, put it on a plane of existence far beyond the average lifeform, it often employs agents to prepare the way for itself and deal with any mortal beings that could potentially stand in the way of its goals. 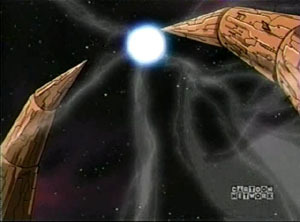 These agents are usually super-powerful beings that Unicron has encountered and been somehow impressed by during its travels. 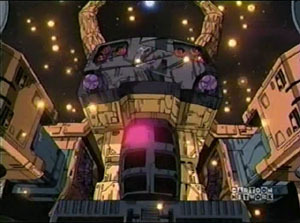 Unicron itself was actually staggered and seemingly annihilated by the combined might of the Transformers and Mini-Cons, but many have become suspicious about whether this force of nature can ever truly be destroyed. 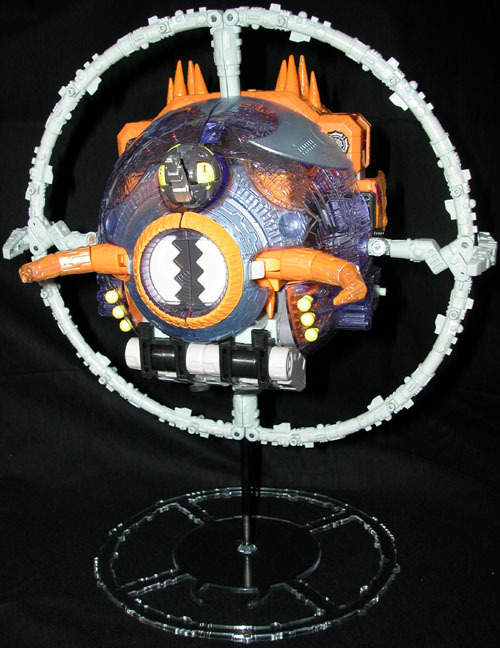 [From the Personal Files of Over-Run, Mini-Con] I saw this monstrosity destroy my world, my Cybertron, before I arrived on this one. 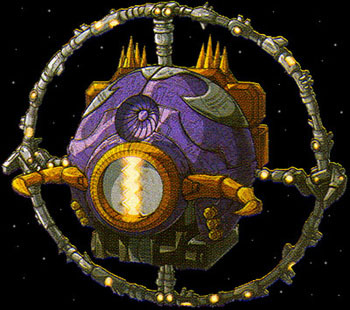 I must admit that it was satisfying to watch us hurt and humble this bringer of chaos, but I am still unsettled by the encounter. Can corruption and hate ever truly be destroyed? Although I am hesitant to tell the others, I still fear that this being may have only been the shadow of a far greater evil. For the sake of my new home, I hope that I am mistaken. 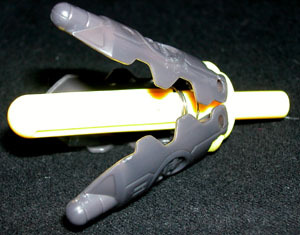 Weapons and Abilities: Subject's abilities are incomprehensible, with powers that appear infinite to mortal onlookers. 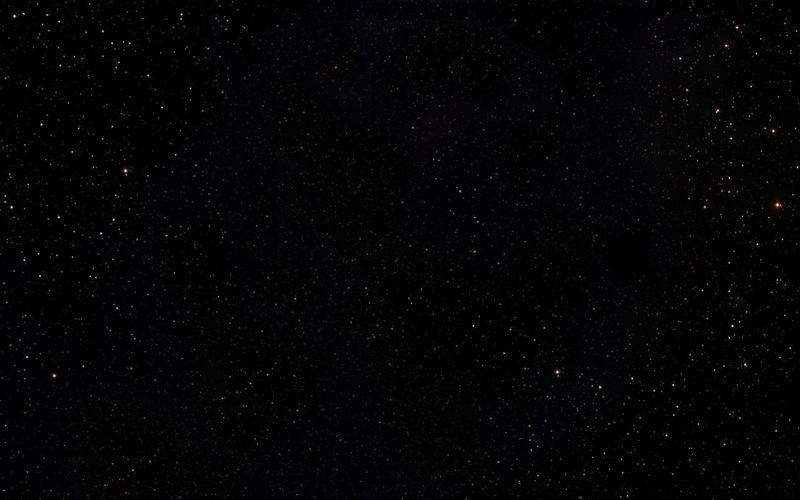 The size of a planet, Subject can easily absorb most worlds into itself for sustenance, increasing its energy levels even more. 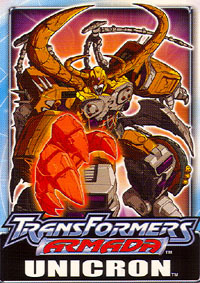 It can also transform itself into a gigantic robot form. 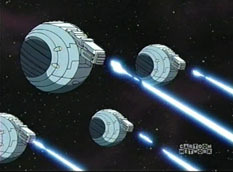 In terms of offensive capabilities, Subject's size alone makes it an unstoppable juggernaut, but it also possesses numerous methods of attack such as an array of missile batteries and other planetary-scale weaponry. Even Subject's mentally projected "voice" can have a disconcerting and damaging effect on those who hear it. 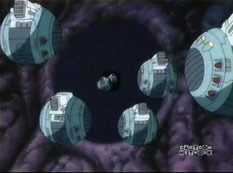 It has a defensive grid that works like an immune system to prevent small threats from infiltrating its superstructure; this defense system is based around plentiful copies of the MiniCon known as Dead End. 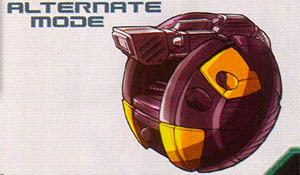 Weaknesses: Virtually invulnerable in the physical sense, Subject can ignore most attacks with an obliviousness that transcends mere arrogance. However, it is unprotected on a mental and spiritual level to concepts such as inn'ocence and purity. The basic ideas of "goodness" are intrinsically incomprehensible by Subject, being so antithetical to its nature that a concentrated dose of them can confuse or even destroy Subject's corporeal systems. 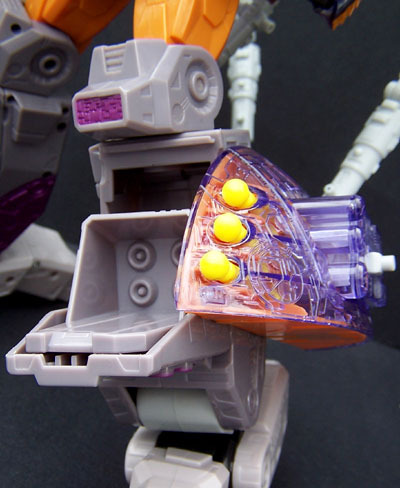 This may be why the Mini-Cons pose such a threat to Subject as a group. 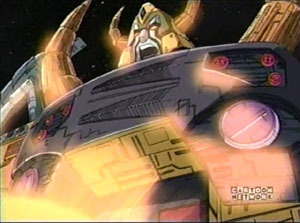 In one form or another, Unicron has either appeared or been mentioned in just about every incarnation of the Transformers Universe. 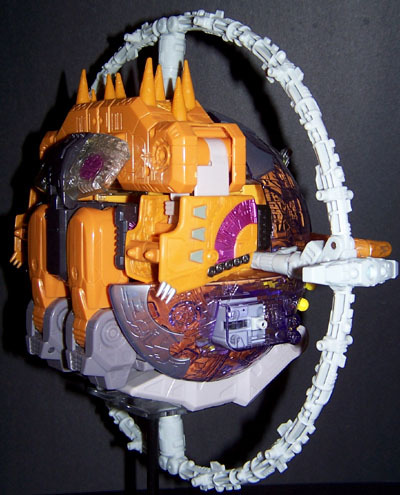 G2: is there a connection between "The Swarm" and Unicron? 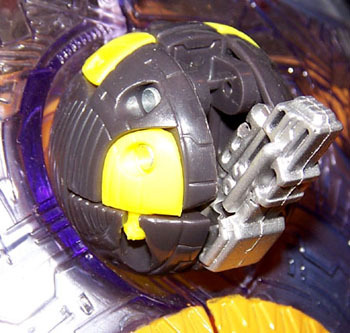 Beast Machines: Rattrap mentioned that Megatron in the form a a giant flating head was a "giant tirbute to Unicron." 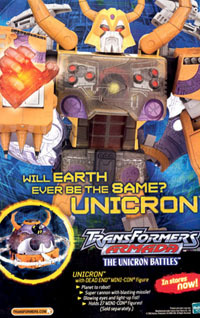 Cybertron: unknown at this time if Unicron has any involvement in this series. Bio: No being has experienced more horror in its lifetime than Dead End. Long ago, he witnessed the destruction of his home world at the hands of J..i.nkrsm, and had to endure the loss of everyone he had ever known or cared about. 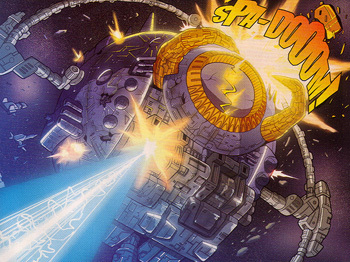 Yet Unicron spared Dead End for some unknown reason, keeping him alive within its form. 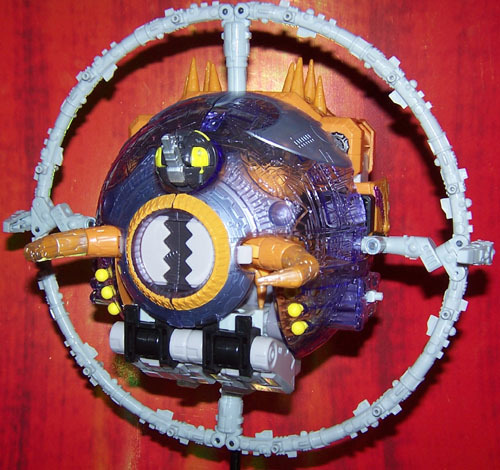 Since then, the formerly rational and cheerful Mini-Con was alternately subjected to solitary confinement, forced to watch as Unicron destroyed yet another world, or experimented on relentlessly by Unicron's internal systems. 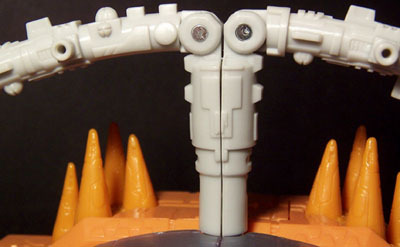 Millennia of such torture proved more than the Mini-Con's psyche could bear, and he descended into gibbering lunacy. 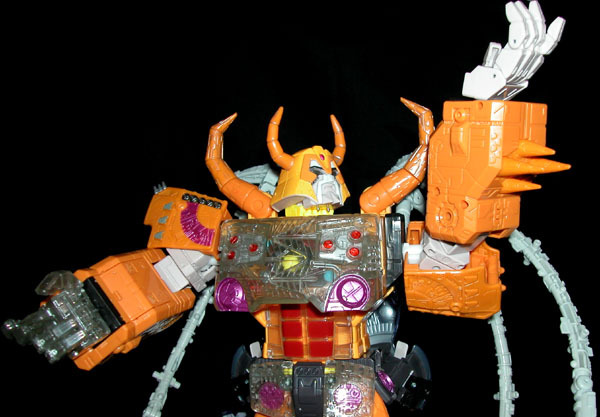 Kept alive as a source of fresh data for creating more copies, Dead End resides hidden somewhere in Unicron, a crazed madbot who has been exposed to information that no mortal mind was ever meant to contain. 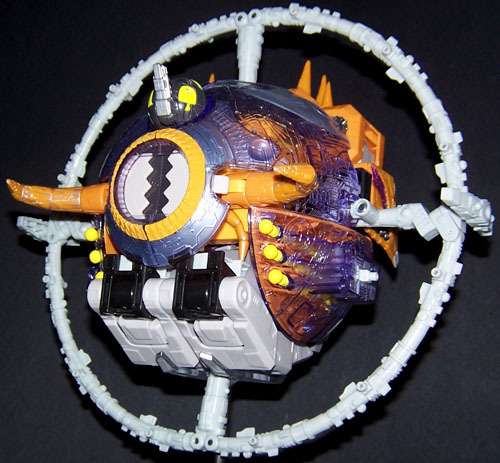 Weapons and Abilities: After a seemingly endless span of time absorbing the ambient energy of Unicron, Subject now possesses strength far greater than most Transformers, let alone Mini-Cons. His intelligence level is debatable because of his present mental deficiencies, although he was once considered quite clever. 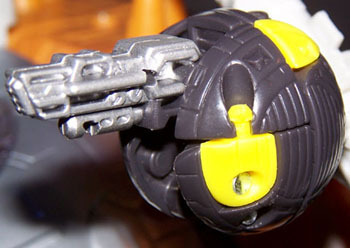 In both modes, he wields a powerful cannon that can fire standard laser blasts or be used to separate targets into their basic, elemental components. 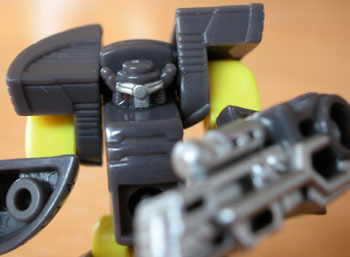 Weaknesses: Although Subject experiences brief bursts of clarity, he is hopelessly insane. 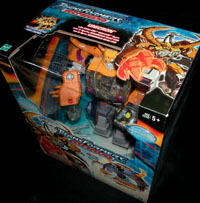 "Best of the Best 2003" Thousands of toys enter the ring... Only one walks out, what are the best toys of 2003? 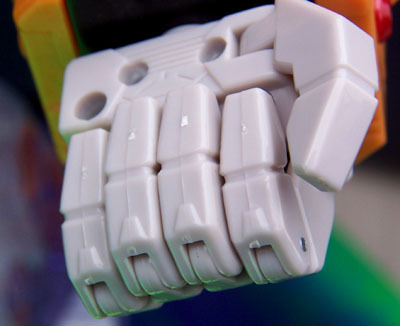 Have you ever picked, up a toy that was so cool, so detailed or poseable or just plain fun that you couldn't put it down? This happens to us almost every day of the year. 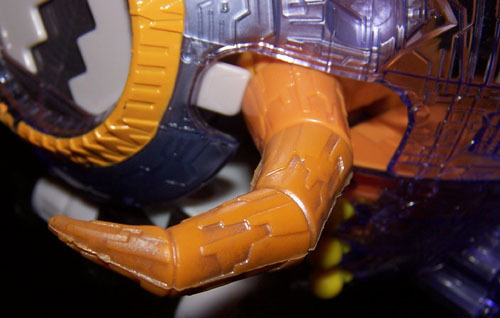 We love toys, and we're living in a golden age of action figures. 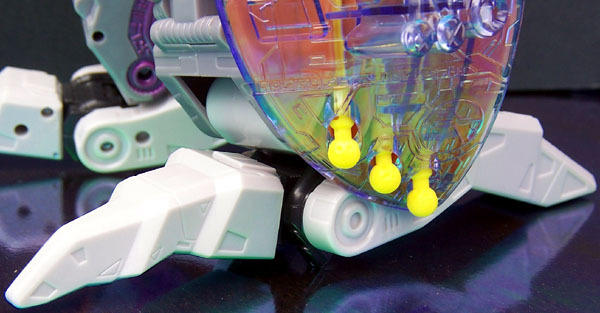 So to try to sort through every fantastic figure and pick the one that we feel is definitively best in each category... well, it hurts. 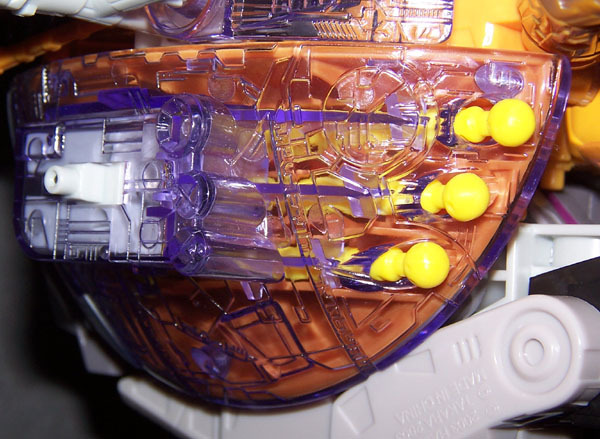 But it hurts so good, because these are the toys that we feel need to be honored. 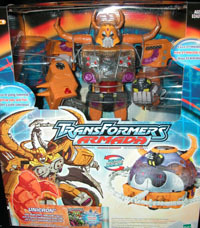 So get off your asses and give these toys a standing ovation...this may not be the Oscars, but it's way more important! 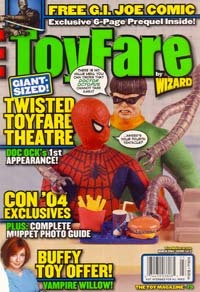 After dolling through such categories as: best likeness, best poseability, best playset, best action feature... we get to the grand finale, "TOY OF THE YEAR"
When fans are waiting for and anticipating something for 17 years, expectations get damn high...and that means the odds of disappointing those fans also become higher. (If you don't believe us, look at the response to the Star Wars prequels.) So what do you call something that actually delivers on the pent-up fan expectations that develop over 17 years? 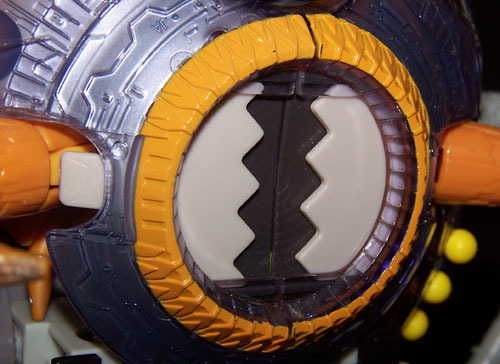 The Toy of the Year, that's what! 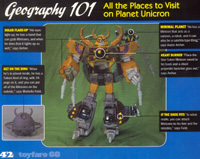 Ever since his debut in 1986's Transformers movie, Unicron has been the toy dream for fans of all ages. 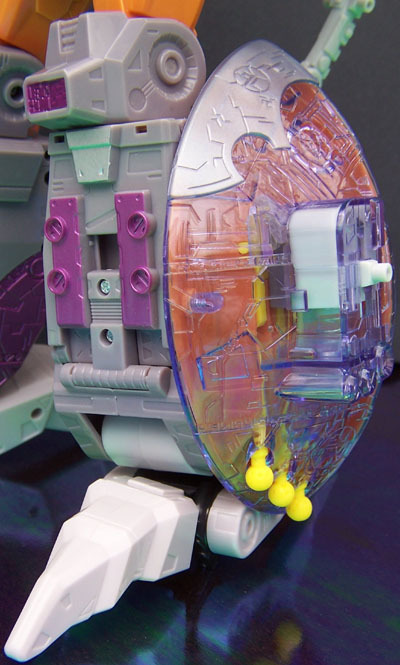 After several unused prototypes came and went, it seemed unlikely that the giant, planet-gobbling mechanoid would ever make it to store shelves. 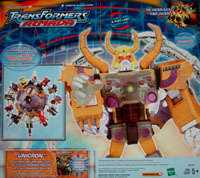 2003 changed all that when Unicron was introduced in the Transformers Armada toy line...but would this be the Unicron that everyone was waiting for? Short answer: yes. 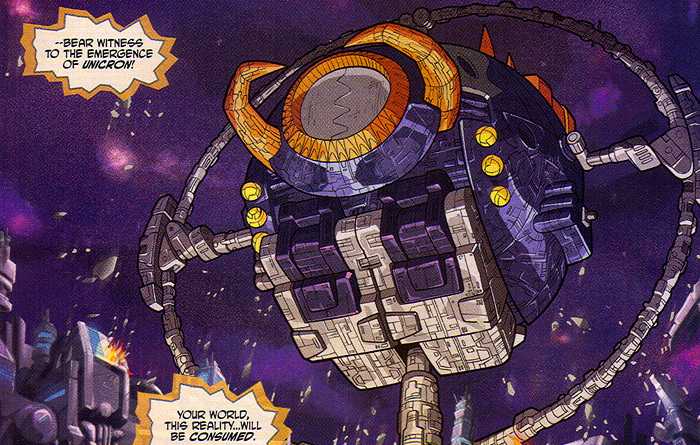 Minor discrepancies in form and color aside, this is Unicron. 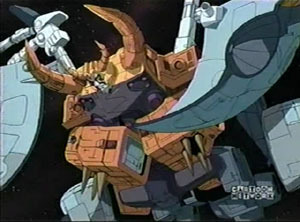 The 16-inch tall behemoth transforms from planet mode to robot, just like the original in the movie, complete with a chomping mouth for devouring the unfortunate. 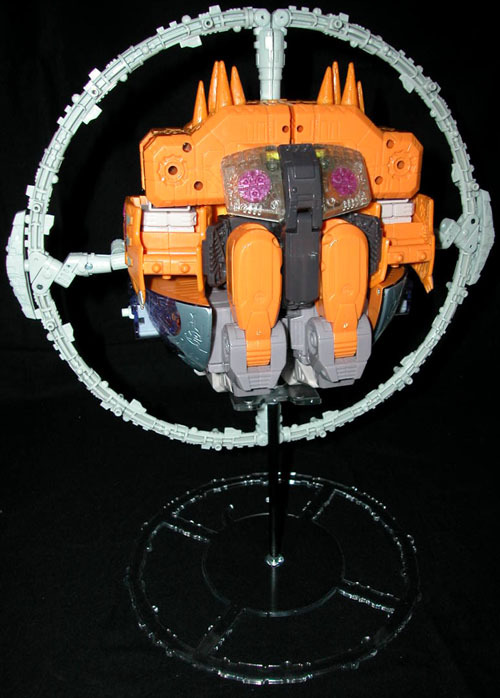 In keeping with the Armada gimmick, he's got his own transforming Mini-Con (Dead End) and enough MiniCon-activated missile launchers to make your head spin. 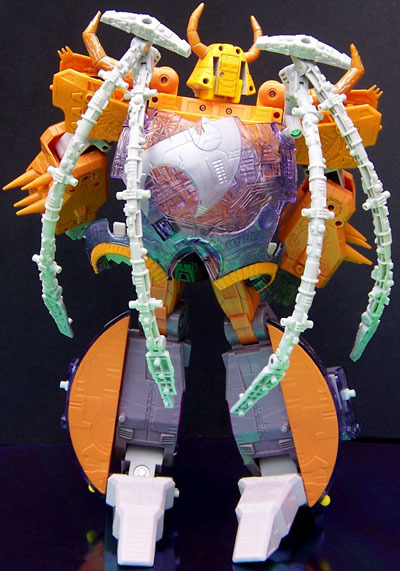 Plus, unlike those earlier prototypes, this Unicron features way more poseability than a guy who turns into a planet should reasonably be expected to have. 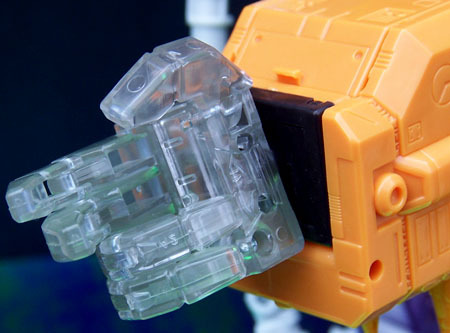 With a few of Takara's World's Smallest Transformers or Hasbro's Heroes of Cybertron in his hands, you can finally live out Transformers: The Movie with your toys the way you wish you could have in 1986. 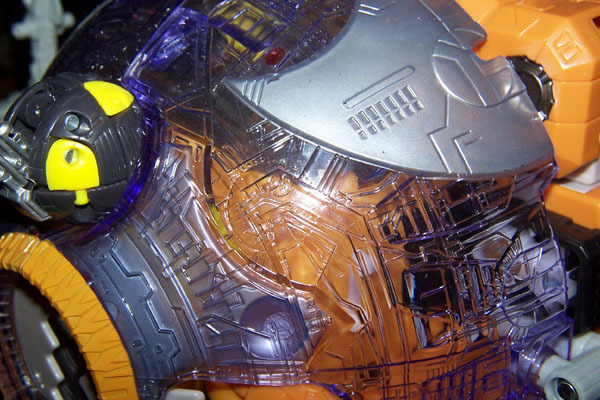 Before winning the "Best Toy of 2003" award in the January 2004 issue, this toy was highly anticipated and anxiously awaited by fans. 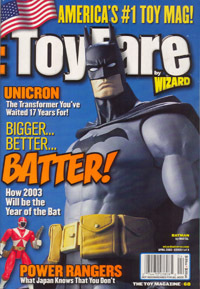 ToyFare featured it on the cover of issue #68, April 2003 which included an entire feature article on it. Below are exerpts, written by Zach Oat. 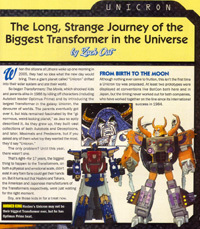 "The Long, Strange Journey of the Biggest Transformer in the Universe!" 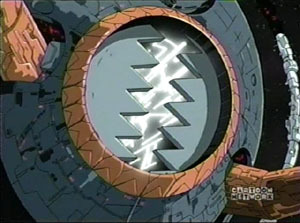 When the citizens of Lithone woke up one morning in 2005, they had no idea what the new day would bring. 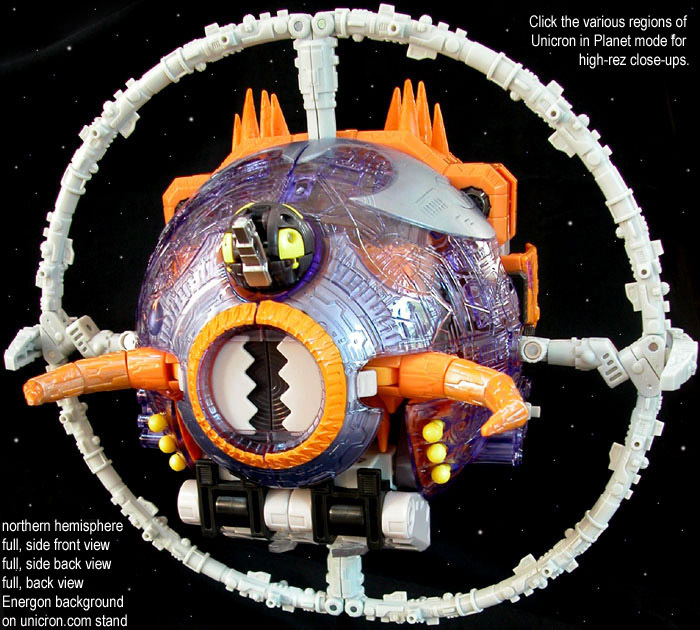 Then a giant planet called "Unicron" drifted into their solar system and ate their world. 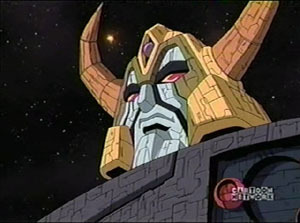 So began Transformers: The Movie, which shocked kids and parents alike in 1986 by killing off characters (including Autobot leader Optimus Prime) and by introducing the largest Transformer in the galaxy: Unicron, the devourer of worlds. 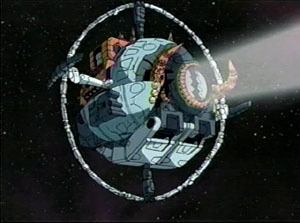 The parents eventually got over it, but kids remained fascinated by the "ginormous, weird-looking planet," as Jazz so aptly described it. 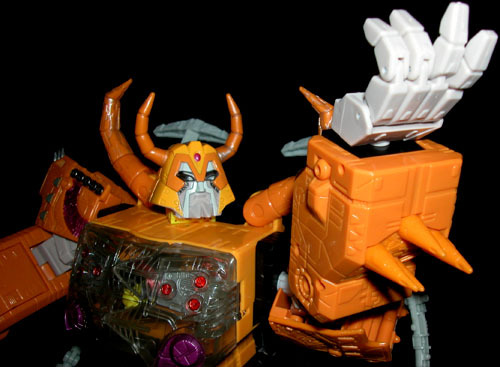 As they grew up, they built vast coliections of both Autobots and Decepticons, and later, Maximals and Predacons, but if you asked any of them what toy they wanted the most, they'd say "Unicron." The only problem? Until this year, there wasn't one. 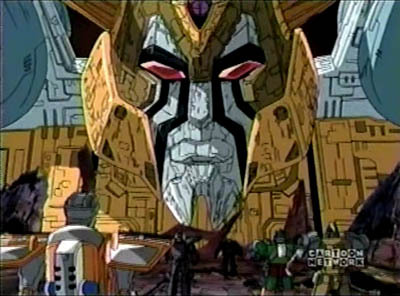 That's right-for 17 years, the biggest thing to happen to the Transformers, on both a physical and emotional scale, didn't exist in any form fans could get their hands on. 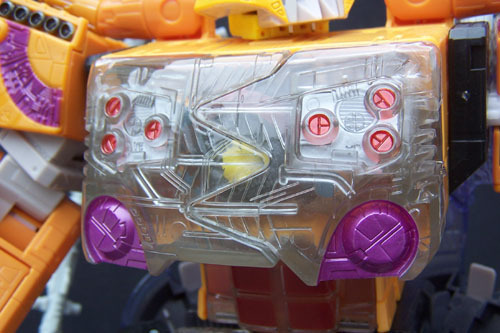 But it turns out that Hasbro and Takara, the American and Japanese manufacturers of the TFs respectively, were just waiting for the right moment. Boy, are those kids in for a treat now. 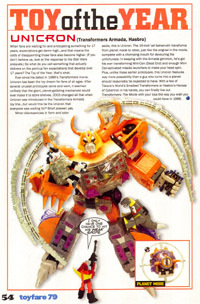 FROM BIRTH TO THE MOON Although nothing ever carne to fruition, this isn't the first time a Unicron toy was proposed. 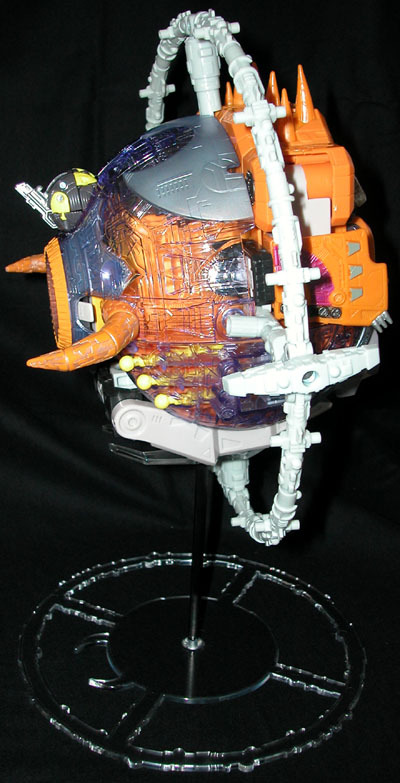 At least two prototypes were displayed at conventions like BotCon both here and in Japan, but the timing never worked out for both companies, who have worked together on the line since its international success in 1984. 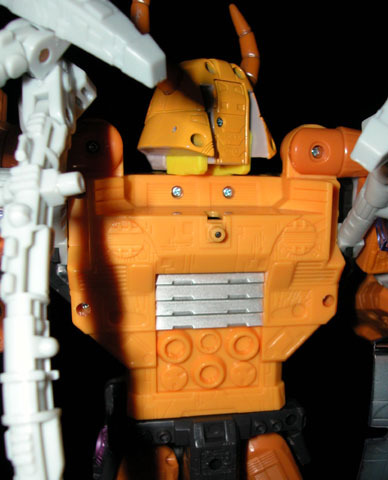 "Takara made a prototype within the last four years," says Aaron Archer, head designer for I Transformers at Hasbro. 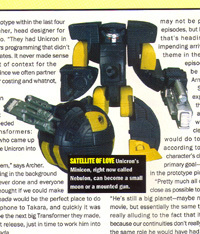 "They had Unicron in some of their Beast Wars programming that didn't make it to the United States. It never made sense to do a character out of context for the American market, and since we often partner up on responsibilities for costing and whatnot, it never got produced." 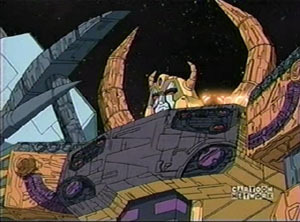 The idea for a Unicron toy was never far from Archer's mind, however; in fact, when Hasbro needed a big toy for the Transformers: Armada line, it was he who came up with the idea to introduce Unicron into the cartoon. "We wanted a large item," says Archer. "He's always been looming in the background as a character we've never done and everyone kept wanting to see. 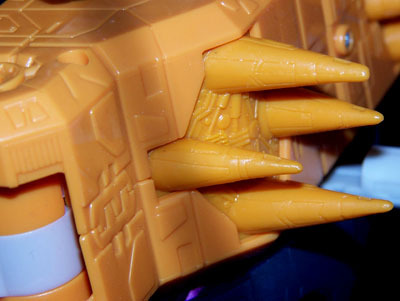 I thought if we could make him relevant again, Armada would be the perfect place to do it." 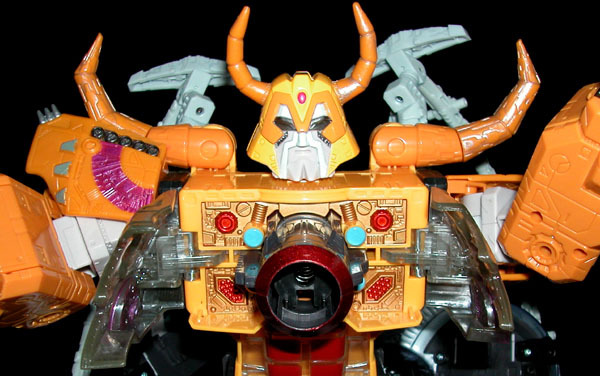 Hasbro got on the phone to Takara, and quickly it was agreed: Unicron would be the next big Transformer they made, scheduled for an August release, just in time to work him into the new season of Armada. 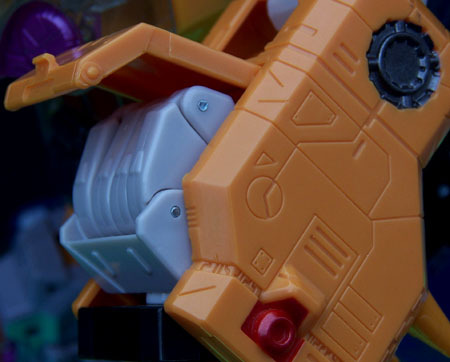 "We're in daily contact, so we pretty much worked together to create what size we wanted and what type of features we wanted," says Archer of working with Takara. "We definitely wanted Minicon interaction. 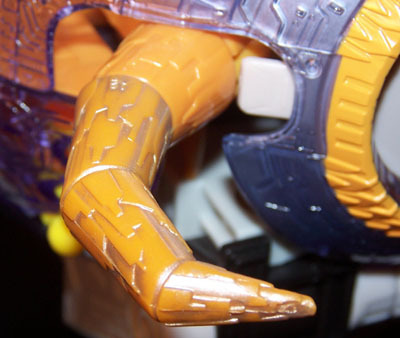 We wanted it to be big and to have cool toy features and articulation, and Takara took that, along with the classic styling, and created it for us." 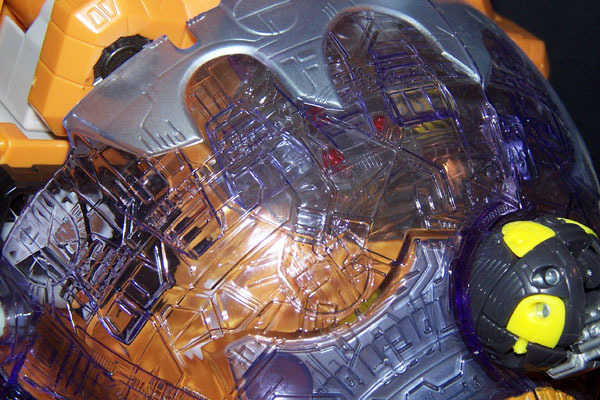 The height was an early issue -Hasbro wanted a big item, but not too big. 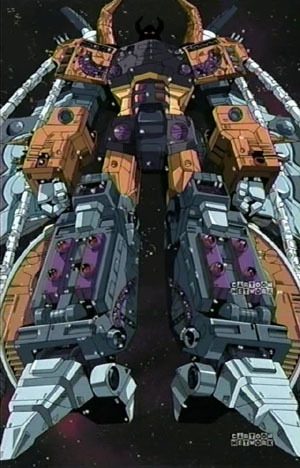 The biggest Transformer toy ever, 1987's 2-foottall Fortress Maximus, recently missed out on a re-release due to its inability to meet current drop-test requirements. 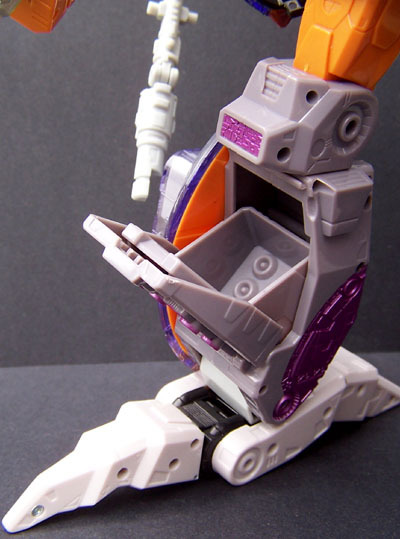 Available space at toy retailers was also a strong consideration. 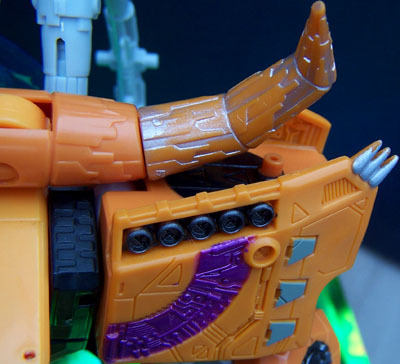 "If it gets any bigger, we can't fit it on anyone's shelf," says Michelle Field, director of marketing for Transformers at Hasbro. 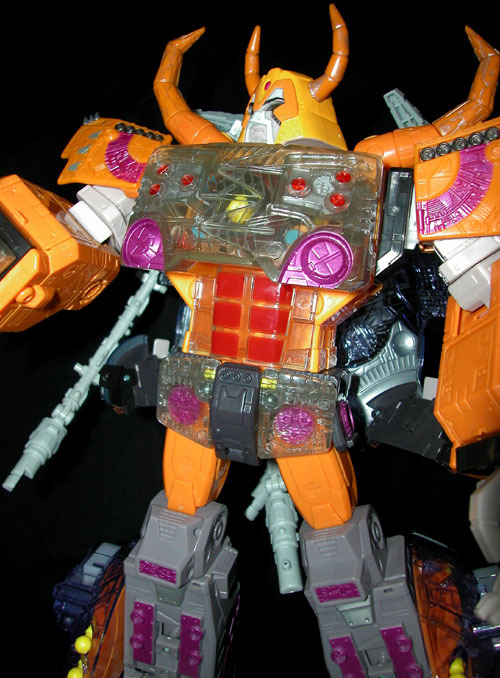 "If we were to do it at 24 inches, I have no idea where we'd put it, unless we put it in planet mode [in the box], and we wanted to have this really cool robot." 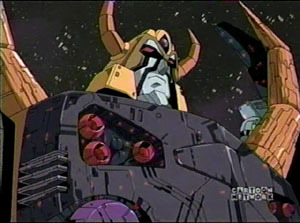 As it is, Unicron stands almost 16 inches tall in robot mode-towering over Armada's Optimus Prime at his tallest-and has a diameter of 12 inches in planet mode. 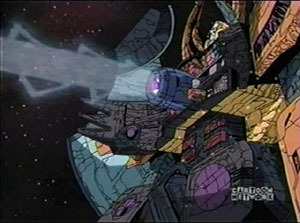 Armada-The Unicron Battles." 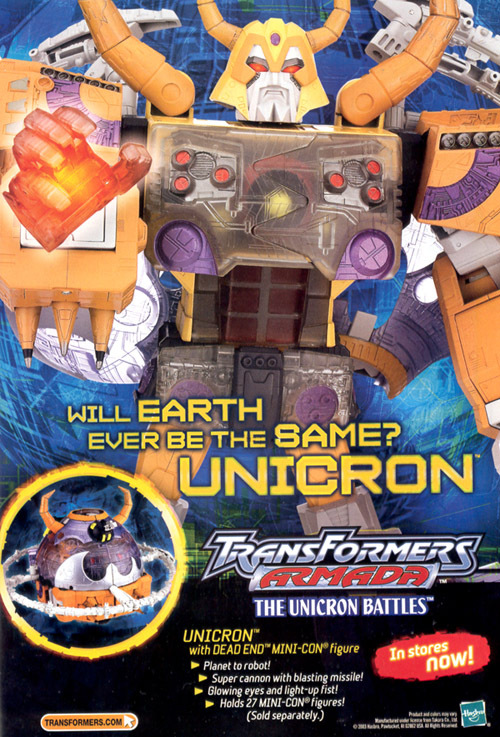 Some skeptical Transfans expressed displeasure when they heard that Unicron would appear in Armada, worried what an alternate-reality show clearly targeted at younger kids would do to their beloved icon. 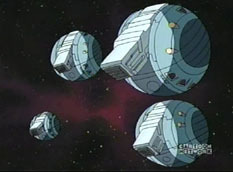 But according to Archer, maintaining the character's classic movie styling was their primary goal -a fact clearly demonstrated in the prototype pix seen. "Pretty much all of us agreed it should be as close as possible to the movie guy," says Archer. 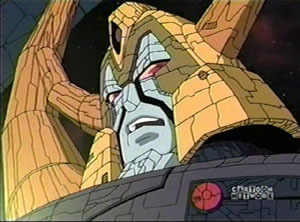 "He's still a big planet-maybe not as big as he was in the movie, but essentially the same character. 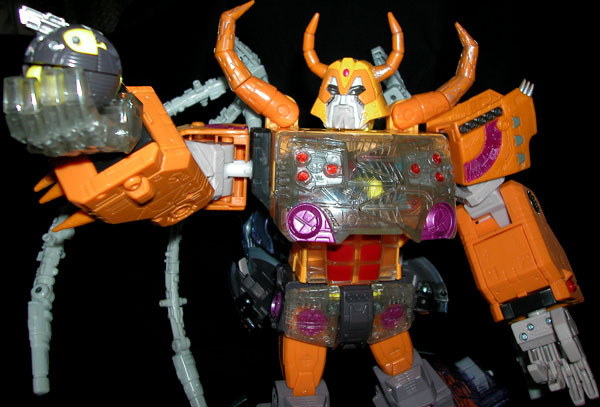 We're not really alluding to the fact that it is <or isn't> the same Unicron, because our continuities don't exactly match up, but he has the same role. 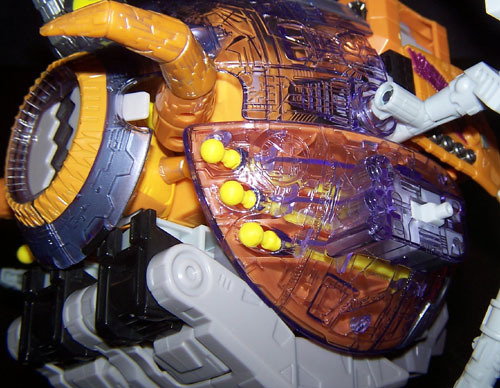 Unicron will still fit into the general Armada storyline, as his quest is apparently also for those elusive little Minicons. 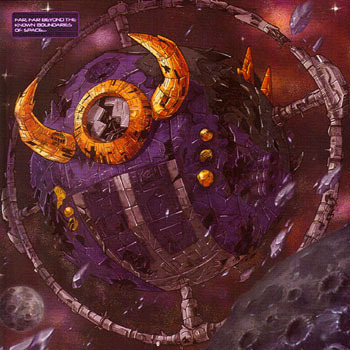 Not only does he come with a Minicon of his own-an orbiting planetoid tentatively, named Nebulon <originally, but changed to Dead-End> -but he himself is a living, breathing Minicon collector, covered with points for Minicon storage and packed with interactive Minicon-triggered features. 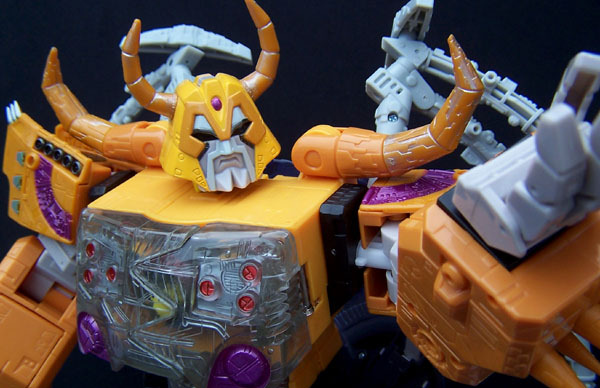 KlCKlN' IT OLD SCHOOL Unicron isn't the only classic Transformer resurfacing this year; Hasbro will be continuing their re-issue of classic "Generation One" figures at Toys "R"Us through the spring. 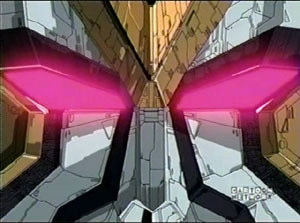 Thundercracker, Silverstreak (a.k.a. 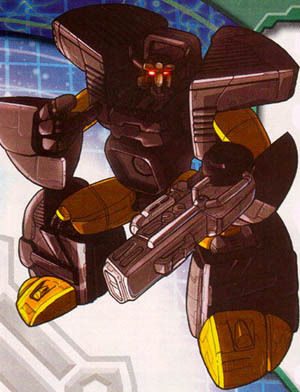 Bluestreak) and Jazz hit in February, while Skywarp, Prowl and Red Alert reach shelves in April. 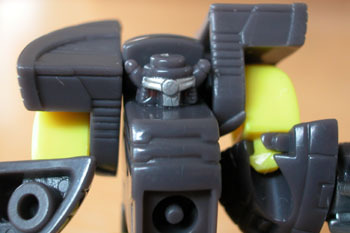 However, G1 fans should keep an eye out for some familiar names in the Armada line as well. 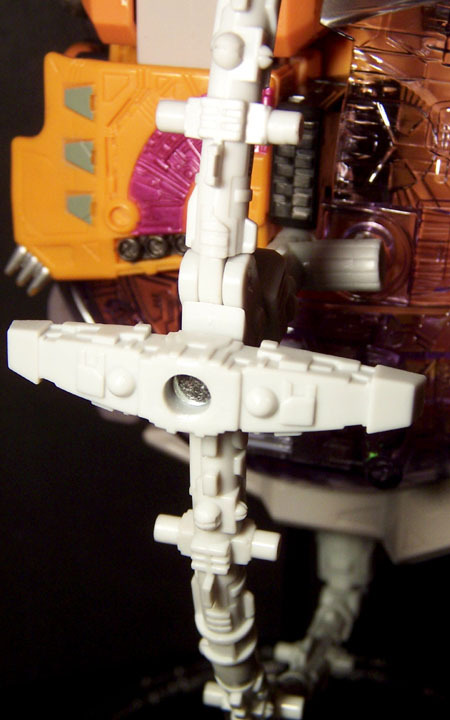 This month, an Armada-style Thundercracker goes on sale, heralding the formation of an all-new Seeker team with his brothers Skywarp and Starscream. 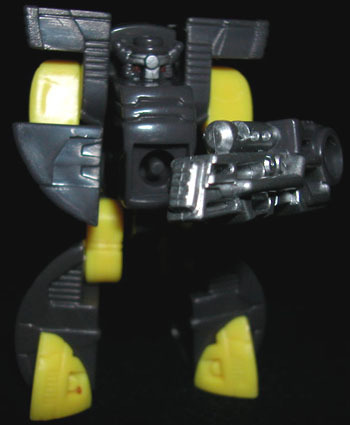 But other characters with familiar names, like Thrust and Sideswipe (both due in stores this month), may not be as older fans remember them. "We do use other names from classic characters, but they're not those characters," says Archer. 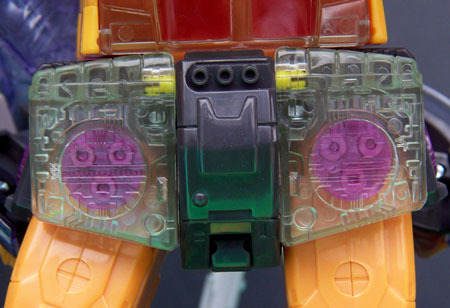 "We always design the toy first, and then, if a certain amount of characteristics are there and it's the appropriate spot to use it, we'll use the old name to maintain that in our continuity." 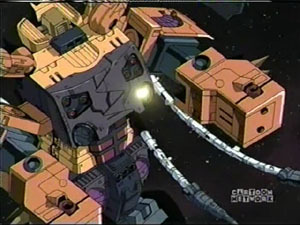 One name fans will recognize made its first appearance next to Unicron in TF: The Movie. 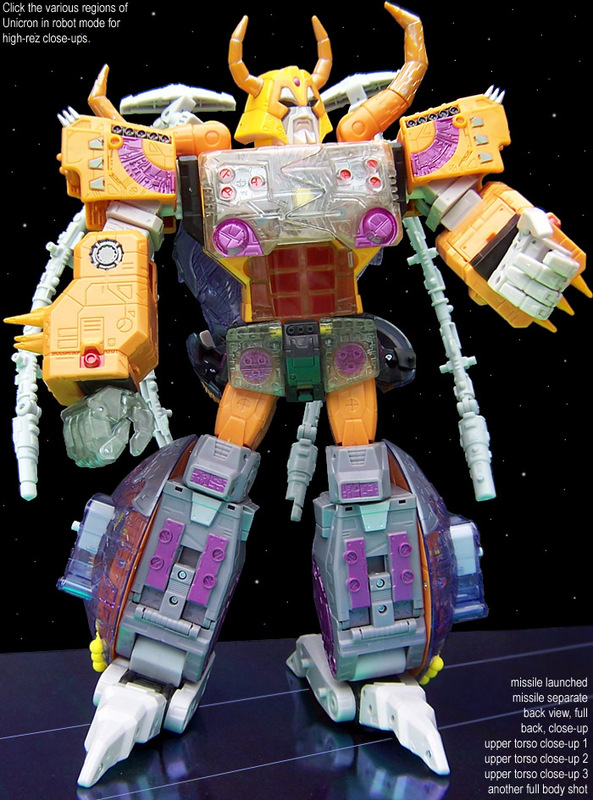 While Unicron created the Gl Galvatron from Megatron's remains in the film, Armada's Megatron will also somehow become Galvatron before the show is through, shifting his green-camo color scheme to a white and purple. "I can't tell you how the story is going to go," says Archer. 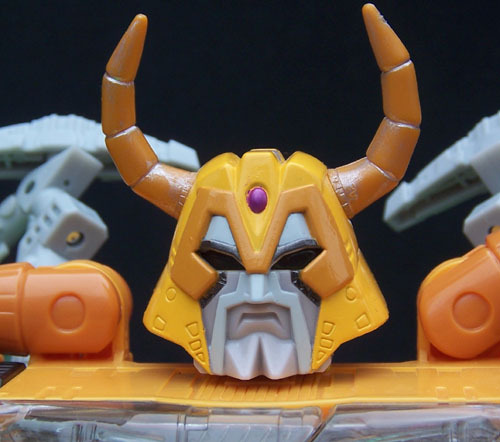 "I know that he does undergo a change as he collects more Minicons and gets more power." 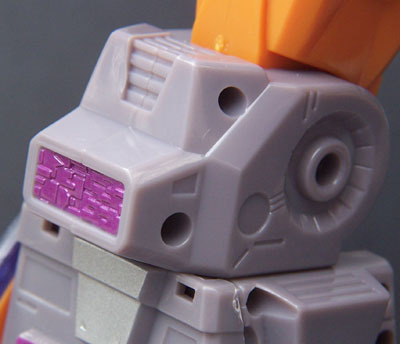 When using old names, like Galvatron, Archer always wants it to make as much sense as possible. "We try to keep their essence. 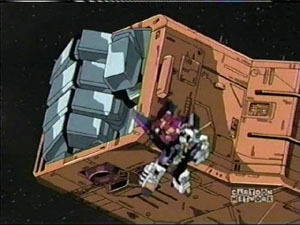 For instance, we like to always make sure Scavenger is a construction vehicle, and Prowl is always a police or emergency-type car." 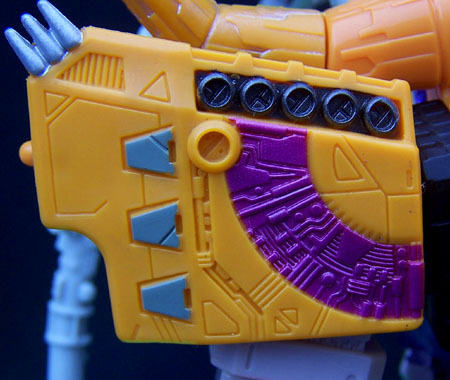 Recognizable paint schemes, like on the new Thundercracker (and the upcoming Skywarp), can also help capture the spirit of old characters. "There are a few, the second Hot Shot, for one, I think people will like," says Archer. "It'll remind them of a classic Gl character." 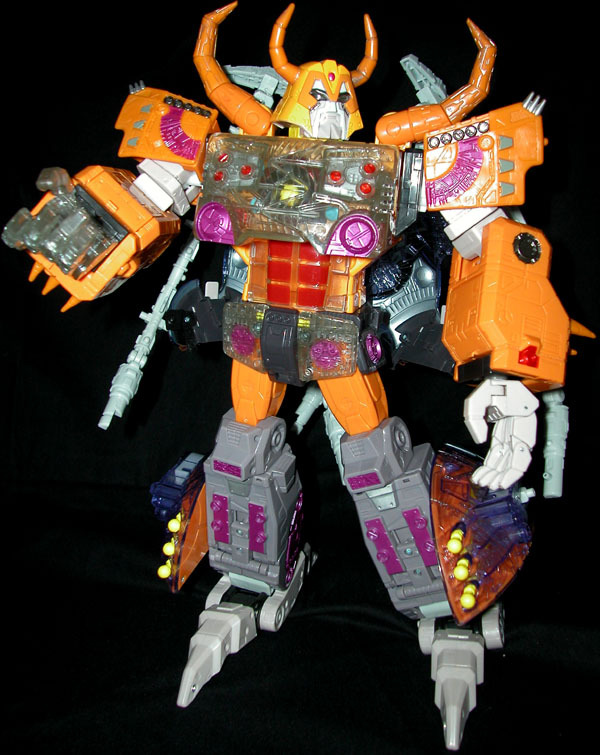 Might this be yet another "hot" TF: The Movie color scheme? Here's hoping Archer will spare the "rod" and spoil all us overgrown kids. 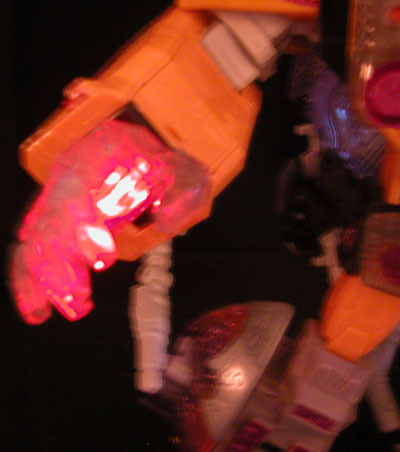 Editor Zach Oat liked TF: The Movie, but he always wondered why Optlmus Prime didn'tg come out of that coma at the the end the film. 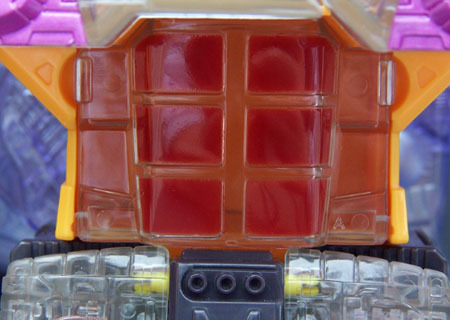 Wake up, Optimus!